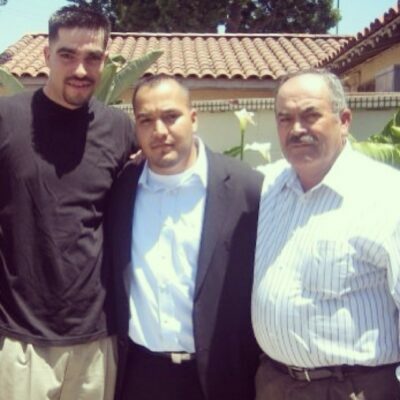 Ferreol Cardenas, Jr. (left) in a photo posted by a relative, Omar Ferreol Cardenas (center), on Facebook three days after Cardenas, Jr.’s death. “This is my Brother Ferreol Cardenas, Well everyone calls him Chato…Unfortunately he passed away yesterday…I guess only God knows why…He will be missed dearly from our family…Rest in peace Bro…” wrote Cardenas. It isn’t clear what Ferreol Cardenas, Jr. was doing on Rosecrans Avenue a little before 9 p.m. on a Thursday in 2014. Cardenas, Jr., 32, didn’t live or work in the South Bay. In fact, he didn’t have a job; a drive-by shooting had left him disabled, according to his family’s attorney. But the fact that he died of injuries inflicted by two Manhattan Beach police officers on the night of April 10, 2014 isn’t disputed. The Los Angeles County coroner labeled his death a homicide due to head trauma. His family is suing the city of Manhattan Beach and the two officers in federal court, alleging wrongful death and police negligence, among other things. A Manhattan Beach Police spokesperson declined to comment, saying that the department doesn’t discuss lawsuits, and referred a reporter to the city attorney’s office. An email and phone call to the city attorney weren’t answered. Cardenas, Jr.’s sister, who answered at an address listed for the family in the Florence-Graham neighborhood of Los Angeles, declined to talk. Williamson, who didn’t speak to Cardenas, Jr. before he died, said he used the crime investigation report given by the officers to outline the events in the lawsuit. Since 2003, Cardenas, Jr. had been in jail at least four times, according to court documents. Twice he served time for possessing drugs or drug paraphernalia; once for petty theft. At the time of his death, he appeared to have been on probation for the drug paraphernalia violation. According to the lawsuit, Cardenas, Jr., was driving west on Rosecrans Avenue when Officer Michael Lynch, driving a marked patrol car, noticed that Cardenas’s car was missing a license plate. Cardenas’s car switched lanes quickly, the complaint said, almost striking the police car. Lynch turned on his lights and signaled for Cardenas to pull over. 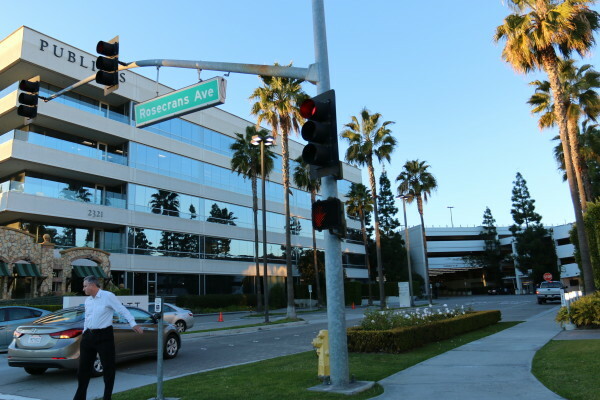 Cardenas kept driving past Aviation Boulevard and then pulled into a driveway just after the building that houses Paul Martin’s American Grill. Near the end of the driveway, Cardenas stopped the car, got out and took off running, according to the lawsuit. Lynch followed him on foot, ordering him to stop and lay on the ground multiple times. Eventually, Cardenas stopped running. He put his left arm by his side and his right arm in front of his waistband and then started walking north. Lynch told Cardenas that he would tase him if he didn’t stop walking. When Lynch was three feet away from Cardenas, the lawsuit says, he discharged the Taser. Cardenas’s body became rigid and fell to the ground, though he didn’t hit his head, the complaint notes. Cardenas sat up with his knees bent and feet on the ground. Around this time, another officer, Brandon Muzatko, arrived as backup. Cardenas was taken to Little Company of Mary Hospital in Torrance, where he was treated for head trauma, among other things, and was released five days later on April 15, 2014. Cardenas returned to the hospital on April 22, 2014, saying he had severe headaches and neck stiffness. Soon after arriving, he was put in the intensive care unit. He stopped being able to move his limbs or talk and was put on life support. He died on April 25, 2014. On June 20, 2014, Cardenas’ parents, Ferreol Sr. and Rosa, filed a claim with the city. It was denied on September 23, 2014. On March 1, 2015, almost a year after their son’s death, they filed the lawsuit. According to Williamson, Ferreol Jr.’s cousin, who works for the Los Angeles County Sheriff’s Department, encouraged the couple to hire Williamson.